Arrive at Delhi International airport. On arrival in Delhi, the guest will be met by our representative and transferred to hotel. This morning you will be taken to visit Old Delhi - Former centre of Moghul Power, Old Delhi offers ancient monuments, narrow streets and bustling bazaars. Drive past the Red Fort (Monday will be closed), built in 1648 and board the 'rickshaw ride' for a unique experience from the Red Fort, through "Chandni Chowk" or Silver Street, experiencing the sights and sounds of this very busy avenue heading west from the Fort. Later visit the Jama Masjid, the greatest mosque in India and completed in 1658 by Shah Jahan who also built the Taj Mahal. This afternoon you will be taken to visit New Delhi - drive past the stately government buildings of the British Era designed by Lutyens, including the India Gate & the Presidential Palace. Continue onto the beautiful Humayuns tomb of the Mughal era & predecessor of the world famous Taj Mahal. End the tour at the towering minaret of Qutab Minar. Taj Mahal -This most famous Moghul monument was constructed by Emperor Shah Jahan in memory of his wife Mumtaz Mahal "the lady of the Taj". It has been described as the most extravagant monument ever built for love, for the emperor was heartbroken when Mumtaz died after 17 years of marriage, during the birth of her 14th child.The central structure has four small domes surrounding the huge, central dome. Above the tombs of Mumtaz Mahal and Shah Jahan are false tombs, a common practice in Indian mausoleums. (Taj Mahal is closed on Friday). Stay at pristine Taj Mahal for sunset, to see this true Wonder of the world in gentle late afternoon light. 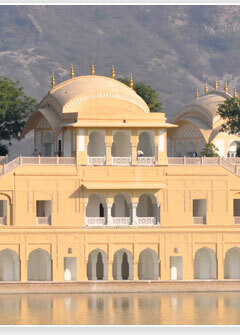 Morning tour of the impressive Amber Fort, situated on a ridge just outside Jaipur City. At the foot of the hill you will mount your caparisoned elephant for the slow but steady climb up to the main gate, making your entrance in the time honoured fashion. Afternoon tour of the City - "The Pink City" is spectacularly set within surrounding rugged hills, dotted with ancient ruined fortresses. Your tour will include the imposing City Palace, still home to the Maharaja although several of the rooms are now open to the public. Many antiques and artefacts belonging to the ruling family are housed here, including a collection of weaponry. You will also visit the Hawa Mahal "Palace of the Winds", and the open-air Jantar Mantar Observatory to see the vast astronomical instruments. Enjoy a stroll through the colourful bazaar before returning to your hotel. and to perform their rituals in its waters, to the accompaniment of temple & folk music. Upto 200000 traders and 50000 cattle pour into town, along with numerous festooned camels and colourful pilgrims. After 10 hectic days of livestock dealing, camel racing and colourful festivities, everybody goes for a big holy dip in the lake on the night of the full moon. (Kartik Purnima). Upon arrival in Pushkar - check into the Royal Camp captures the luxurious nostalgia of a bygone age of the Maharaja's Safari and Shikar camps, combined with innovative design demonstrating many of the skills and crafts of Marwar. Afternoon City tour of Pushkar - Pushkar boasts temples, though few are as ancient as you might expect at such an important pilgrimage site, since many were deserted by Aurangzeb and subsequently rebuilt. Full day at the fair. Built as 'an explosion of fun, frolic, games and laughter', the fair provides some wonderful photographic opportunities and is a rare change to see Rajasthani women decked out in all their traditional jewellery, dress and finery. Temple music wafts through the night, as the fires die down and the Rajasthani melodies played on the stringed ek-tara come to a close.On the night of the full moon, the pilgrims bathe by moonlight, then send marigold and rose petals floating across the lake on green plate-like leaves. It is worth getting up early to see the camels and tribes rousing themselves in the pink of the dawn desert light. 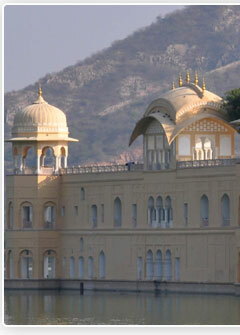 Morning drive to Ajmer (15 Km) Upon arrival in Ajmer, straight proceed for city tour. The Emperor Shah Jehan's white marbles pavilions are in a delightful park on the east banks of the man-made Ana Sagar Lake. 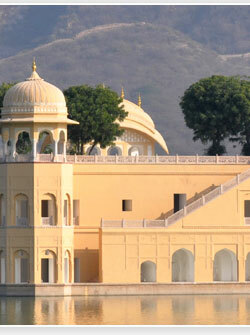 Ajmer, located 135 km southwest is the most sacred of all Muslim places of pilgrimage in India. 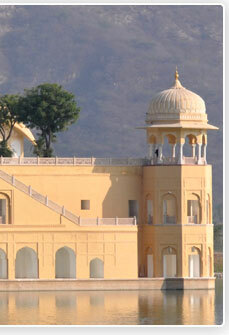 Ajmer is a green oasis on the shore of Ana Sagar Lake, hemmed in by barren hills. 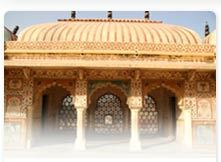 Historically Ajmer has always had great strategic importance. It was founded in 7th century by Ajaipal Chauhan. He named it Ajaimeru the 'invincible hill', because here he raised Taragarh, India's first hill fort. Beyond the Dargah is the Adhai din ka Jhonpra an ancient Sanskrit college, which was converted into mosque in 1198 and remains one of the finest monuments of medieval India. On arrival in Delhi, the guests will be met by our representative and straight proceed to International airport for flight back to home.